This box houses an incredible variety of multimedia features and ports, but the touted 4K transcoding disappoints. When it comes to sheer volume of media features, the $320 QNAP TS-251A is unrivaled for the price. It features an HDMI port for direct output (1080p) to a display, as well as a remote so you can navigate the Smart TV-like onscreen interface on said connected display. QNAP’s ambition for this box isn’t to augment your multimedia setup—but to be your setup. Sadly, the 4K transcoding that’s part of QNAP’s multimedia pitch, didn’t fare well in our testing. 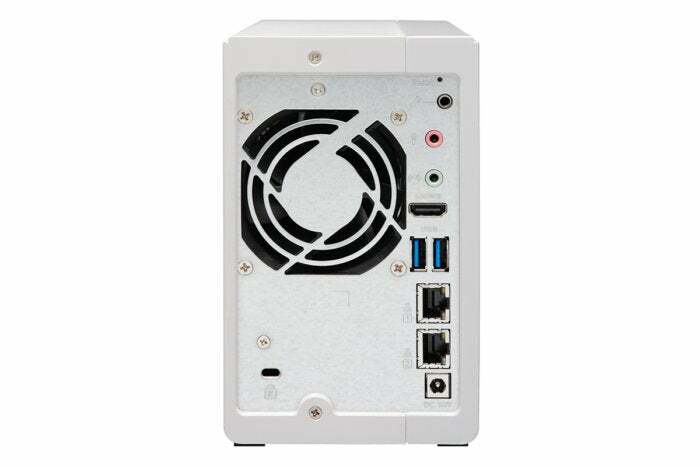 The TS-251A is a dual-bay (front-accessible), largely plastic NAS box featuring an Intel Celeron N3060 CPU that ships with either 2GB (our test model) or 4GB of system memory. It also does something we’ve never seen a NAS box do: function as direct-attached storage when plugged into your PC’s USB port. The box may also be set up and configured that way, rather than at the end of an ethernet cable. Nice. On the front of the TS-251A are a Type B USB port, a Type B micro-USB port, and an SD card slot for quickly copying multimedia files to the box. Press the copy button next to the ports and voila! The back of the TS-251A is home to two USB 2.0 ports, dual gigabit ethernet ports supporting aggregation, as well as speaker and microphone jacks, just in case your direct-attached display doesn’t have speakers, or if you want to feed audio to something more sonorous. 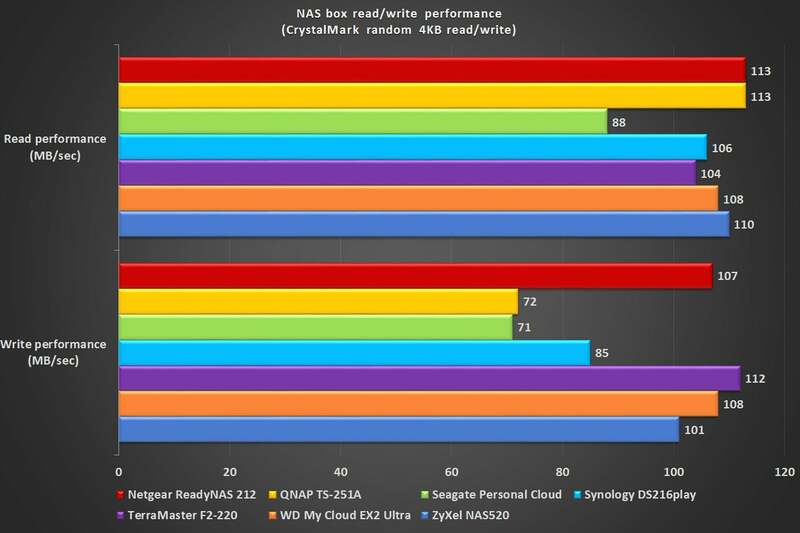 The QNAP TS-251A is a fast reader, but its write performance was near the bottom of the pack. The QNAP’s multimedia software features include iTunes and DLNA serving, web apps for playback directly off of the box, and apps for iOS and Android mobile devices that do the same. QNAP’s boxes also support the audiophile Roon streaming service with its high-quality up-sampling via a free third-party server. The Roon service itself is pricey, but it delivers CD-quality sound from nearly any type of file. You can even attach a USB TV tuner to the TS-251A and record OTA or cable shows. Sadly, you can’t redirect video or audio through its HDMI port. 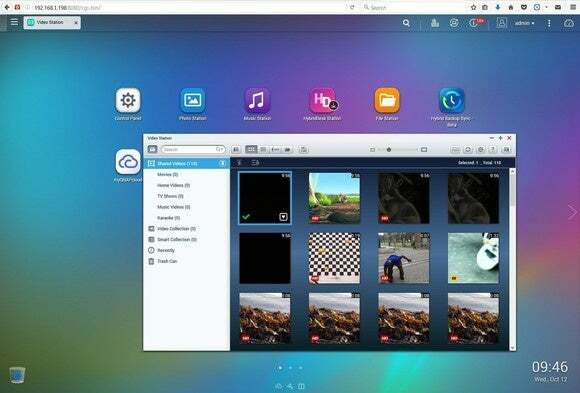 The QNAP video app running in its own window-within-a-browser-window. Alas, the TS-251A’s hardware-assisted 4K transcoding didn’t work as well as we’d hoped. Then there’s the on-the-fly transcoding of 4K UHD (2160p) video to 1080p or lower resolution. This is done only if you’re using QNAP’s QVideo app on your mobile device—it won’t work via DLNA. Even with QVideo, the results were rather disappointing. Where the Synology DS216Play would transcode even 60fps, 8-bit 2160p (not 10-bit) and play it smoothly (albeit with a noticeable drop in quality), the TS-251A would not. The results were generally so slow as to be unwatchable. Additionally, HEVC video is not supported, only h.264 (AVC). Streaming 10-bit 2160p via DLNA (which is format-agnostic and relies on the destination hardware) was fine. On the other hand, the TS-251A, as do all QNAP boxes, offers stellar backup capabilities. I use a QNAP box to initiate all the backups on my network. Rsync, ftp, external media—it supports it all of those in both directions. My only complaint is that the OS won’t spin down externally attached storage to save power and wear and tear on the drive. Internal drives can be spun down. Advice: For now, stick for now with QNAP’s older Backup Manager app rather than the newer Hyper Backup Sync, which proved buggy in my testing. Alas, Dropbox syncing, which used to work, was broken in the Cloud Drive Sync app. Dropbox sync does work in Hyper Backup Sync. That's sloppy, QNAP. The TS-251A sports an HDMI output for driving an external display at 1080p. Like Synology, QNAP offers a synchronization service, QSync, that you can use to keep the data on all your computers and mobile devices synced with the TS-251A. 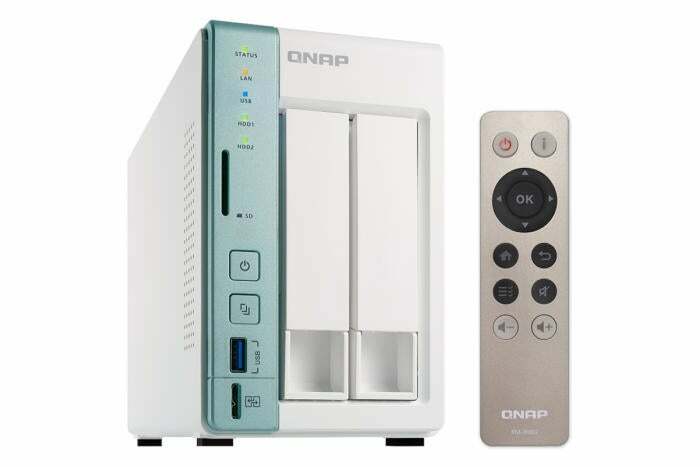 QNAP boxes also interface and sync directly with online storage vendors such as Amazon Drive, DropBox, Google Drive, OneDrive, and about a dozen more. QNAP offers wide a selection of other apps, good for everything from hosting your website or blog to tracking USB surveillance cameras. I also find the QNAP operating system the best organized and easiest to navigate of all the windows-in-a-browser interfaces. One other TS-251A perquisite: a five-year warranty. Most NAS boxes offer only two or three years. Though we were disappointed in its weak 4K transcoding (which few people need) the TS-251A is still a monster multimedia and backup box that can serve as your media setup, not just augment it. And with its vast array of other abilities, it’s easily one of the most versatile boxes we’ve tested. Note: As of 5/27/2017 Hybrid Backup Sync was still less robust than it should be. To reiterate, if you have the option, stick with the older Backup Manager until QNAP fixed it. Typos in this article were also fixed on 5/27/2017. QNAP's TS-251A NAS has the ability to output video directly to an external 1080 display. It's a great addition to a home multimedia setup. The advertised 4K transcoding, however, doesn't support HEVC.